Mount Assiniboine in the eponymous Mount Assiniboine Provincial Park is also known as The Matterhorn of the Canadian Rockies because of its resemblance to the Matterhorn in the Swiss Alps. The countless number of trails makes it a perfect hiking destination for all looking for the pristine backcountry experience without crowds. Explore with us Magog Lake, Nub Peak, Sunburst Lake, Cerulean Lake, The Meadows, Wonder Pass and many more. Although most of the travelers might have seen the picture of the Mount Assiniboine before, not everyone knows where it is located. The reason is simple. The area of the Canadian Rockies is so packed with must-see lakes and mountains which are easily accessible (sometimes, you can literally park few meters away) that for most of the visitors there is no reason to go further into the wilderness and no reason to find out where is the mountain from postcards. In this post, we will show you how to get the most of the area in only two days! Mount Assiniboine provincial park lies in British Columbia. The provincial park has a triangular shape, and its neighbors are Kootenay National Park to the West and world-known Banff National Park to the East. There is no road leading directly to the park. It means you can get to the park using the power of your foot or you can fly in a helicopter. If you'll choose the ground access, the nearest point access point is Mount Shark Parking Lot near Canmore or Sunshine Village in Banff. Before setting off to the Assiniboine Provincial Park, you can book your accommodation in Canmore or Banff and enjoy the night before the real outback experience. We'll start with the helicopter option. You can either fly from Canmore for $200 + GST or from Mount Shark Helipad for $175 + GST. To get to the Mount Shark Helipad, you must drive around 50 minutes from Canmore on a gravel road, down the Spray Lakes - Smith Dorien Road, and past the Mount Engadine Lodge. The road is very dusty but completely fine to drive on. The flight from Mount Shark takes about 8 minutes, and a bit longer from Canmore, but the views are stunning, and it is worth every single cent. All flights reservations must be booked via Assiniboine Lodge. A helicopter is a perfect option when you're short on time, when you plan to stay longer in the park, and your backpack is heavy (the maximum load is 40 lb per person) or simply when you want to enjoy the scenery from bird's-eye view. If you are camping in the area, you need to have a confirmed campground reservation before booking helicopter flights. The other way how to get to the park is to hike in. You can either start from Mount Shark Parking Lot (you can choose from two routes - via Assiniboine Pass or supposedly more beautiful Wonder Pass) or from the other side - from Sunshine Village in Banff. Both ways are similar in length, 26 to 30 kilometers. If this seems too long for you, there are campgrounds along the way from each side so you can split the hike into more days. To enjoy the immense beauty, it is always better to stay longer, but in general visitors usually, spend from one to five nights in the park. To get the most from our two days visit, we decided to reserve a helicopter from Mount Shark Helipad. We booked 11 AM time and about midday we appeared in Mount Assiniboine Provincial Park. The views from whirlybird were terrific! From the Mount Assiniboine helipad, it is 20 minutes walk to Lake Magog Campground. We pitched a tent, had a quick lunch and went for a walk. In one afternoon, you can easily see Magog Lake, Sunburst Lake, Cerulean Lake, Niblet Viewpoint & Niblet Peak and The Meadows. The other day we got up early as the hike back was about 30 km long. We decided to take the route back via Wonder Pass instead of Assiniboine Pass. 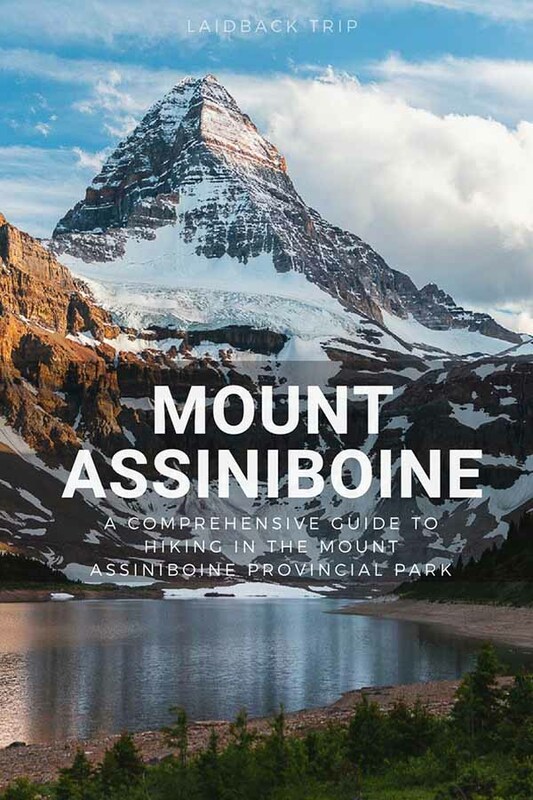 The hike from Mount Assiniboine Park is less strenuous than hiking in from the other direction as it goes mostly downhill, and you will get views of picturesque Marvel Lake before you'll reach the forest and views disappear. Do not forget that if you flew in, your car is not on the trailhead parking lot but on the parking lot near the helipad and it is additional 2 km to get there (you don't need to walk on the road but take a shortcut via cross-country forest path). To hike all the way to Mount Shark makes it a long day - it took us about 9 hours as we had heavy backpacks. You can send your backpack back with a helicopter, but check the schedule as it doesn't fly every day ($3 per kilogram). When entering the Assiniboine Provincial Park, you should keep in mind, that you are in a bear country and act according to it. Especially from June to September, it is feeding season for bears and their cubs, and it's better to take all precautions. You should have at least some basic knowledge of what to do when you encounter a bear plus having a bear spray is a must. During only two days in the park, we saw two huge grizzly bears and two cubs around 200 meters away from us so we can't stress enough how important is to be ready for all situation which can happen. Camping is the cheapest option how to spend a night in the park. The main campground is called Lake Magog Camp and cost $10 per person plus $6 is a reservation fee. From 2018 the reservation is required and can be made up to 4 months in advance via Discover Camping Reservation System. The campground has 29 spots and offers everything you might need for a night. Toilet, grey water pits, water (the water is not drinkable and you should either treat it or boil it before use, but we drank it as the most of visitors without treatment and didn't experience any issues), open kitchen shelter and bear lockers. Other two accommodation options are bookable via Assiniboine Lodge directly. The five Naiset Huts are rustic dorm-style accommodation. It provides basic accommodation with toilet, communal kitchen shelter, and fireplace. The cost is $25 per night and spots are booked out very quickly. Reservations are mandatory throughout a year to have the bed guaranteed. By far the most comfortable (and also the most expensive) accommodation in the Mount Assiniboine Provincial Park is the Assiniboine Lodge. The summer and winter rates vary but be prepared to pay around $330 per person. Rates include all meals, guide services and access to a sauna. The minimum stay is two nights. The stay comes expensive, but we believe that especially in the winter, the night there must be magical. Now, when you arrived in the park and accommodated yourself, finally comes the fun part. To explore the whole area you would need more days, but we have good news. Some of the most photogenic places are incredibly close to campground, huts or lodge. The lake nearest to the campground offers spectacular reflections of nearby mountains. The best place to take beautiful photos is the most northernmost tip of the lake, but don't worry about it much as views are rewarding from all tangles without exception. Beautiful Lake only about 15 minutes walk from Lake Magog Campground. One the way we came across Lizzie Rummel's old cabin and an incredible number of mosquitos, don't forget to take Deet with you. The Mount Assiniboine is very nicely seen from the shore of Sunburst Lake. Another noteworthy lake in the park which offers reflections of Sunburst Peak. The lake is at the elevation of 2250 meters above sea level, but we probably haven't mentioned yet, that the whole park is quite high and temperatures can drop significantly at nights so come prepared. One of the most scenic places we've ever visited so far. Nub Peak is the highlight of the Mount Assiniboine Provincial Park for sure. You can make a circuit and walk to Nub Peak via Sunburst and Cerulean Lake and get back to the campground via The Meadows. The hike to the peak is not somehow steep or technical. First, you'll come to the viewpoint called Niblet. From this place, you'll already get rewarding views and idea about what to expect, but climb a bit further to the Nub Peak to enjoy the scenery even more! To come back from the Nub Peak, we decided to walk through the area called The Meadows. It is obviously a meadow or a chain of meadows going on from the peak to the lodge and basically almost all the way to Wonder Pass. The Meadows hide lots of small tarns and ponds where the surrounding mountains reflect. There are also lots of bushes where bears are feeding, so make noise when going through this area, we saw one grizzly bear here. It takes about an hour and a half to climb to the Wonder Pass, and in case you don't plan to walk in or out via this trail, you should visit it on a half day trip from the campground or huts. The views from the pass are stunning.